New incorporation of Elevated level II We inform you that we have available the elevated CKMB Control Serum II. It is able to verify the performance of the measurement procedure corresponding to CK-MB parameter using the two available controls:  18024, 1 x 1 mL CK-MB Control Serum  18061, 1 x 1 mL CK-MB Control Serum level II CK and CK-MB concentrations are given on the vial label. 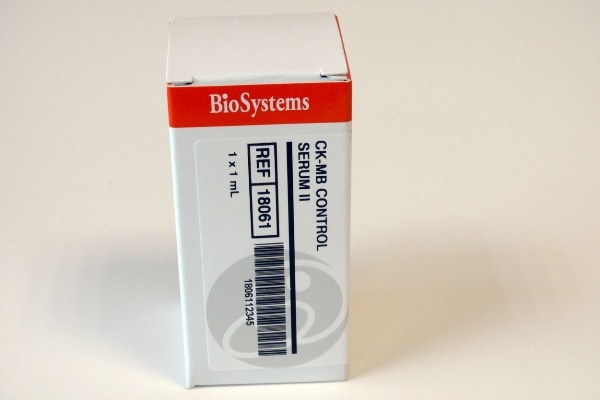 CK value is traceable to the reference system as described by the IFCC Committee on Reference Systems for Enzymes and CK-MB value is traceable to the reference material ERMAD455/IFCC (IRMM). With this new incorporation in the portfolio, the performance of the measurement procedure is verified for the entire range of work.